LARGE: (UK 12 / 14 – USA 8 / 10). The LENGHT is the same for all three size: on the back from centre of neck to longest bit is CM 50 / 20″. 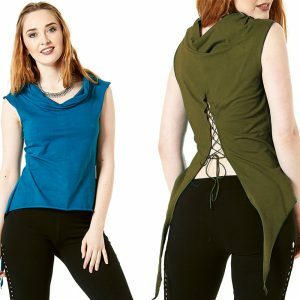 Lovely Steampunk top made of textured fabric. Longer back and side buckle belts. Bust: cm 84 / inches 33. Bust: cm 90 / inches 35.5. Bust: cm 96 / inches 37.7. The LENGHT is the same for all three size: on the back from centre of neck to longest bit is CM 54 / inches 21.2. – See more at: https://www.gekkobohotique.com/lace-steampunk-waistcoat-with-large-hood#sthash.IaTQKEOj.dpufLonger back and side buckle belts. Made of Crochet, cotton and lace.